Salcombe is renowned as a sailing and boating haven, located beside one of the loveliest estuaries in the South West with miles of sheltered water and fine sandy beaches. Chase House enjoys an enviable location overlooking the popular town, towards it’s bustling waterways and picturesque coves. It is an impressive, newly built, family home with far-reaching panoramic view and has a detached double garage with ample parking for several cars and boat storage. This versatile, light and airy 4-bedroom property would be ideal as a permanent home or adaptable as a second property to accommodate a growing family as there is space and scope, subject to the relevant planning permission, to extend further into the roof. 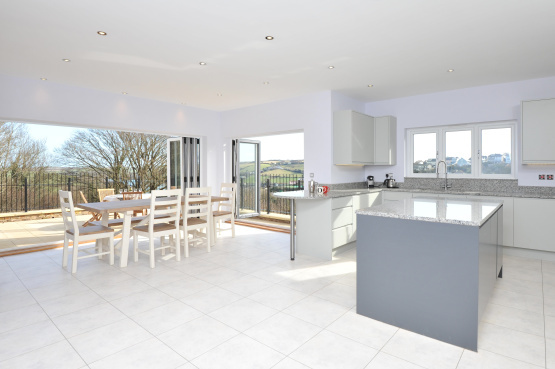 The large kitchen / breakfast room is a particularly pleasant room with 2 sets of bi-fold doors opening out onto the sun terrace, with access to the garden. The owners of the house can feel especially pampered in the massive master bedroom with balcony and sea views.